Ossianic society membership cards of Marion Frances ‘Minnie’ Mackay, 1924-26. Minnie was vice-president, 1925-26. Image, reproduced by kind permission of Glasgow University Archives: ©University of Glasgow Archive Services, GB0248, UGC 202/1/1/1-4. Is e Leabharlann Mitchell aon de na leabharlannan poblach as motha san Roinn Eòrpa le cruinneachadh gun shamhail de stuth tasglainn a tha buntainneach do eachdraidh nan Gàidheal ann an Glaschu. Tha e na dhachaigh do Thasglannan Baile Ghlaschu (Glasgow City Archives), clàran oifigeil a’ bhaile a’ dol air ais gu an 15mh linn, ach cuideachd a’ gleidheadh measgachadh fìor mhòr de stuthan eile a’ gabhail a-steach – leabhraichean, mapaichean, planaichean, iùl-lannan, pàipearan-naidheachd, dealbhan togte, bileagan, Roilean Luachaidh is Luchd-bhòtaidh, agus gràbhalaidhean. Anns an Ionad Eachdraidh Teaghlaich tha farsaingeachd de stòrasan airson eachdraidh teaghlaich a thathar a’ meas a bhith am measg an fheadhainn as fheàrr air an t-saoghal. Tha cuid de chruinneachaidhean a’ Mhitchell co-cheangailte gu sònraichte ris a’ choimhearsnachd Ghàidhlig, mar eisimpleir, clàran chomainn leithid Club Gàidhlig Ghlaschu no de na diofar eaglaisean Gàidhlig. Ach seach nach eil taobh den bhaile anns nach robh Gàidheil an sàs thar nan linntean, bu chòir do làrach an gnìomhachdan a bhith an làthair anns cha mhòr gach seòrsa de stuth a tha an tasgadh. Is e an duilgheadas, gun robh inbhe ìosal na Gàidhlig a’ ciallachadh gu bheil Gàidheil an-còmhnaidh a’ nochdadh ann an clàran oifigeil fon tionndadh Beurla den ainm aca, a’ falach an dearbh-aithne aca mar luchd-labhairt na Gàidhlig. Seach gu bheil eachdraidhean buailteach a bhith air an sgrìobhadh gu tur bho shealladh na Beurla, tha tabhartas nan Gàidheal glè thric air a lùghdachadh no air a leigeil seachad. Gu ìre mhòr, tha dualchas Gàidhlig a’ bhaile air fuireach ‘a-mach à sealladh’. Aig ìre neach fa leth, faodaidh e a bhith doirbh dèanamh a-mach an robh no nach robh Gàidhlig aig neach mura h-eil fiosrachadh ann a thaobh frithealadh eaglais Ghàidhlig, ach ma bha neach à sgìre air a’ Ghàidhealtachd san robh Gàidhlig aig an àm, feumar gabhail ris gum b’ e neach-labhairt Gàidhlig a bh’ ann. The city’s Mitchell Library is one of Europe’s largest public libraries and has an incomparable collection of archive material relevant to the history of Gaels in Glasgow. It is home to Glasgow City Archives, the official records of the city reaching back to the 15th century, but also holds a huge variety of other materials including – books, maps, plans, directories, newspapers, photographs, pamphlets, Valuation and Voters’ Rolls, photographs and engravings. Its Family History Centre contains extensive resources for family history which are considered to be among the best in the world. Some of the Mitchell’s collections relate explicitly to the Gaelic community, for instance the records of associations such as the Glasgow Gaelic Club, or of the various Gaelic churches. Yet as there is scarcely an aspect of the city which has not involved Gaels over the centuries traces of their activities should be present in almost every category of material held. The difficulty is that the low status of the Gaelic language meant that Gaels almost always appear in official records under an Anglicised version of their name, cloaking their identity as Gaelic-speakers. As histories have tended to be written from a completely Anglophone perspective, the contribution of the Gaels is often overlooked or minimised. To a large extent, the city’s Gaelic heritage remains ‘hidden in plain sight’. On an individual level it can be difficult to detect from the sources whether or not someone was a Gaelic-speaker unless there is a clue such as attendance at a Gaelic church, but if someone came from a part of the Highlands known to have been Gaelic-speaking at the time, then it has to be assumed that they were Gaelic speakers. Ann an cruinneachaidhean Tasglannan Ghlaschu tha àireamh de nithean co-cheangailte ri Gàidhlig agus Gàidheil sa bhaile, fiù ged nach eil iad sin an-còmhnaidh air an aithneachadh le ceangal don Ghàidhlig. Chan eil na nithean sin co-cheangailte gu sònraichte ri Gàidheil ann an Glaschu. ’S e aon nì annasach, còta tartain fireannaich a tha a’ dol air ais ann an tìm mus robh toirmeasg air an Èideadh Ghàidhealach, a’ leantainn air aramach nan Seumasach ann an 1745. Tha cruinneachadh ealain a’ Bhaile a’ gabhail a-steach àireamh de phìosan ealain co-cheangailte ri Gàidheil no ris a’ Ghàidhealtachd Ghàidhlig. Nam measg sin tha dealbh ghrinn de mharsantach ainmeil aithnichte ann an Glaschu, Alasdair Caimbeul à Hallyards (1768–1817) leis an neach-ealain ainmeil Albannach aig an àm, Sir Eanraig Raeburn. Aithnichte mar ‘Sandy Doune’ às dèidh àite a bhreith, bha an Caimbeulach na Stiùiriche air Comann Gàidhealach Ghlaschu, a chomiseanaich an dealbh agus aig a’ cheann thall a thug i don Bhaile mar thiodhlac. Aithnichte mar neach-taic làidir do chultar na Gàidhlig, thàinig e bho theaghlach a bha cliùiteach ann an dèanamh dhagaichean, agus bha e na chaiptean air na Sharpshooters Ghàidhealach. Tha e ainmeil mar a’ chiad neach a chòdaich riaghailtean iomain. Tha obair eile bho làmhan Raeburn a’ sealltainn Gàidheal mar dhealbh ainmeil a’ Bhaile de ‘The Macnab’, Francis Mac an Aba (1734-1816), an 16mh ceann-cinnidh air Clann Mhic an Aba. Tha Mac an Aba san robh 6’3” de dh’àirde, air a nochdadh ann an èideadh Leifteanant Còirneal Fencibles Bhràghad Albainn. As there is scarcely an aspect of the city which has not involved Gaels over the centuries traces of their activities should be present in almost every category of material held. Glasgow Museum collections include a number of Items relating to Gaelic and Gaels in the city, even if these are not always recognised as having a Gaelic connection. Not all of these items relate specifically to Gaels in Glasgow. 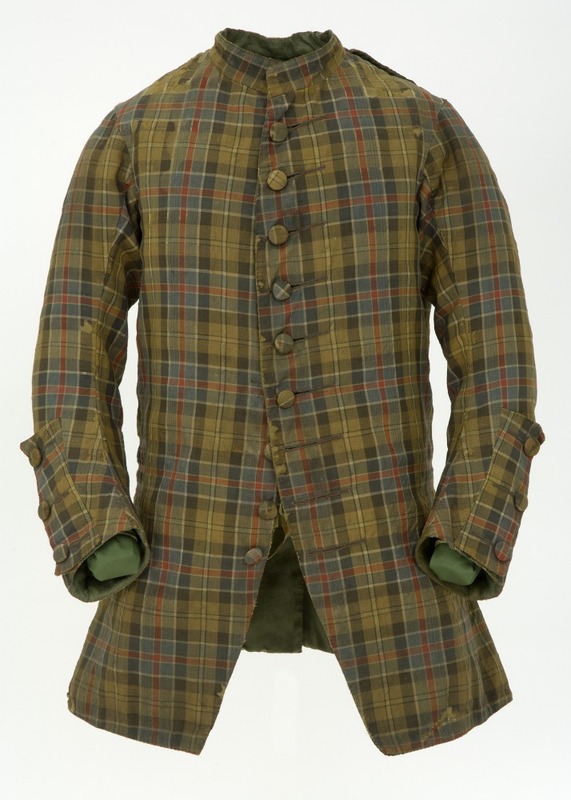 A particularly rare item is a tartan gentleman’s coat which pre-dates the banning of Highland Dress following the Jacobite rebellion of 1745. The City art collection encompasses a number of artworks relating to Gaels or the Gaelic-speaking Highlands. These include a fine portrait of the well-known Glasgow Merchant Alexander Campbell of Hallyards (1768–1817) by the leading Scottish artist of the time, Sir Henry Raeburn. Known as ‘Sandy Doune’ after his place of origin, Campbell was Director of the Glasgow Highland Society, who commissioned the portrait and ultimately donated it to the City. Known as an ardent supporter of Gaelic culture he came from a family of reknowned pistol makers and was captain of the Highland Sharpshooters. He is famous as the person who first codified the rules of shinty. Another Raeburn work depicting a Gael is the famous portrait of ‘The Macnab’, which is on permanent loan to the Kelvingrove art Gallery and Museum. Francis Macnab (1734-1816) was 16th chief of Clan Macnab and notorious for his colourful and dissolute lifestyle. Raeburn dramatically depicts the 6’3” McNab in the uniform of Lieutenant Colonel of the Breadalbane Fencibles. Tha Leabharlann an Oilthigh a’ gleidheadh chruinneachaidhean cudromach de sgrìobhainnean agus leabhraichean clò-bhuailte Gàidhlig. ’S e Sgrìobhainn Fheàrnaig (MS Gen 85) an sgrìobhainn as tràithe, cruinneachadh de bhàrdachd Ghàidhlig air a chur ri chèile le Donnchadh MacRath à Inbhir Ìonaid ann an Ceann t-Sàile, c.1690. Chaidh cuid de na 59 dàin a th’ ann a sgrìobhadh le MacRath fhèin, tha feadhainn eile mòran nas sine. Tha iad a’ còmhdach raon de thèaman poilitigeach agus creideamhach agus tha iad air an sgrìobhadh ann an siostam litreachaidh annasach fogharach a bha air leth do MhacRath. Is e an cruinneachadh as cudromaiche de stuth sgrìobhainn Gàidhlig, na 630 nithean a tha anns na 250 sgrìobhainn ann an cruinneachadh MhicLathagain (1650 duilleagan gu h-iomlan), air an toirt còmhla leis an Urramach Seumas MacLathagain (1728-1805), a bha na mhinistear-feachd do 42mh rèisimeid (Na Freiceadanan Dubha) airson 24 bliadhna agus às dèidh sin na mhinistear ann am Blàr Athaill. À Siorrachd Pheairt bho dhùthchas, bha MacLathagain na neach-cruinneachaidh dùrachdach air dàin is òrain Ghàidhlig air feadh Alba agus fhad ’s a bha e suidhichte ann an Èirinn, Eilean Mhanainn agus Aimeireaga aig àm a’ Chogaidh Neo-eisimeileachd, còmhla ris na Freiceadanan Dubha aig an robh Gàidhlig sa mhòr-chuid. Thugadh saorsa baile Ghlaschu dha ann an 1776. B’ ann nuair a bha e suidhichte ann an Glaschu nas tràithe a’ bhliadhna sin, a fhuair MacLathagain litir air a seòladh thuige gu Taigh-seinnse an Saracen’s Head sa Gallowgate, anns an robh cunntas èibhinn ann an Gàidhlig Ìle air ‘Sgeulachd air Mac Bàilidh Hiorta uair a chaidh e do Bhaile Ghlaschu’. ’S e eisimpleir thràth a tha seo den t-seòrsa sgeulachd abhcaideach mu ‘Ghàidheal faoin sa bhaile-mhòr’, air an robh meas cho mòr. ’S e soirbheachadh ainneamh a th’ ann air rosg Gàidhlig bhon 18mh linn air a sgrìobhadh ann an cainnt neo-fhoirmeil. Am measg Cruinneachaidhean Sònraichte an Oilthighe, tha àireamh chudromach de leabhraichean tràth clò-bhuailte ann an Gàidhlig, a’ gabhail a-steach feadhainn air am foillseachadh ann an Glaschu agus cruinneachadh farsaing de dh’irisean ùineach is leabhraichean bhon 19mh agus 20mh linn, a’ gabhail a-steach mar eisimpleir, a’ chiad eagran de Dàin do Eimhir, agus dain eile, le Somhairle Mac Ghill Eathain, aon de na prìomh phìosan obrach ann am bàrdachd Ghàidhlig an 20mh linn, foillsichte ann an Glaschu ann an 1943. Thathar gu leantainneach a’ cur ris a’ chruinneachadh le foillseachaidhean ùra airson an dà chuid rannsachadh agus teagasg. The University Library holds important collections of Gaelic manuscripts and printed books. The earliest manuscript is the so-called Fernaig Manuscript (MS Gen 85) a collection of Gaelic verse compiled by Donnchadh MacRath, Duncan Macrae, of Inverinate, Kintail, c.1690. Some of the 59 poems it contains were composed by MacRath himself, others are much older. They cover a range of political and religious themes and are written down in an unusual phonetic spelling system unique to MacRath. The most significant collection of Gaelic manuscript material is the 630 items contained in the 250 manuscripts of the McLagan collection (1650 pages in total), brought together by Seumas MacLathagain, Rev. James McLagan (1728-1805), chaplain to the 42nd (Black Watch) regiment for 24 years and later minister at Blair Atholl. A native of Highland Perthshire, McLagan was an avid collector of Gaelic poems and songs throughout Scotland and while stationed with the largely Gaelic-speaking Black Watch in Ireland, the Isle of Man, and in America during the American War of Independence. He was given the freedom of the city of Glasgow in 1776. It was while stationed in Glasgow earlier that year that MacLagan received a letter addressed to him at the Saracen’s Head Inn in the Gallowgate containing a humorous account in Islay Gaelic of ‘Sgeulachd air Mac Bàilidh Hiorta uair a chaidh e do Bhaile Ghlaschu (‘A tale of the Bailie of St Kilda’s son a time he went to Glasgow town’). This is an early example of the kind of jocular ‘naïve Gael in the big city’ story which has proved enduringly popular. It is a rare survival of 18th-century Gaelic prose written in informal language. 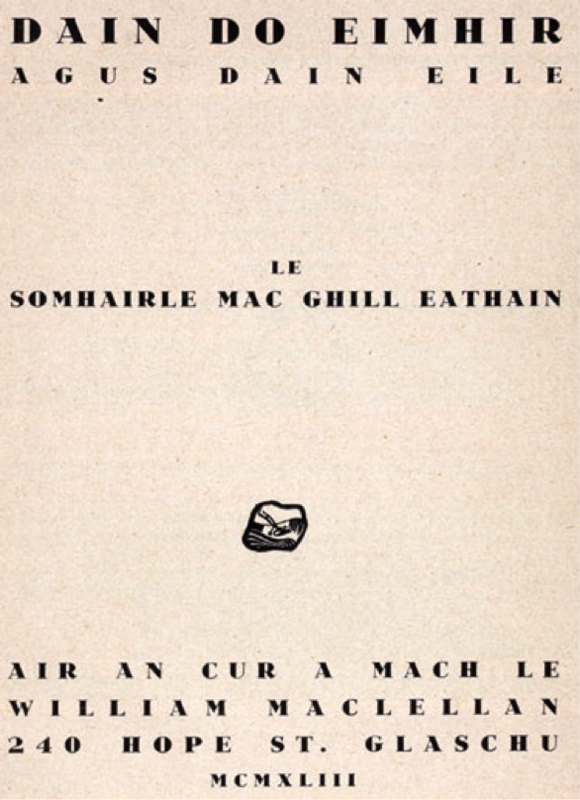 The University Special Collections include a significant number of early Gaelic printed books, including ones published in Glasgow, and an extensive collection of Gaelic periodicals and books from the 19th and 20th century including, for instance, a first edition of Sorley MacLean’s [Somhairle Mac Ghill Eathain], Dàin do Eimhir, agus dain eile, one of the key works of Gaelic 20th-century poetry, published in Glasgow in 1943. The collection is continuously augmented with new publications for both research and teaching. Letter addressed to Rev. 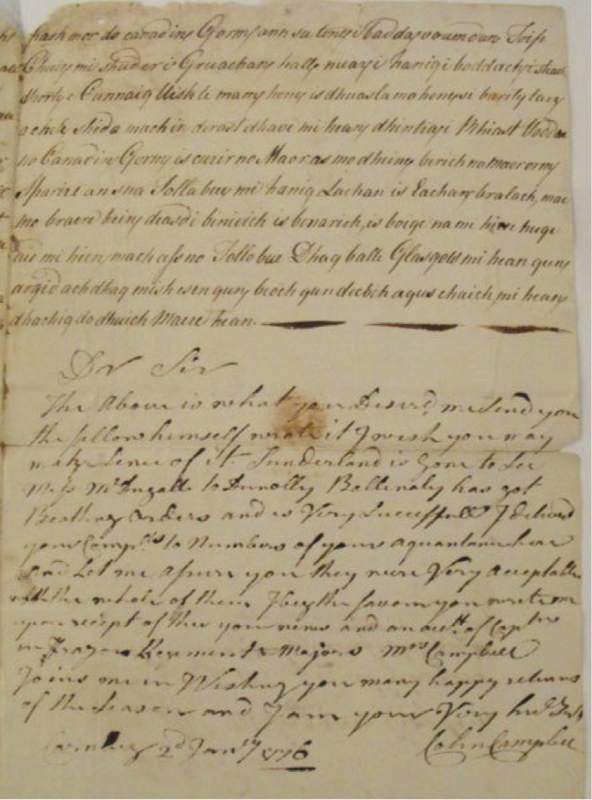 James MacLagan, care of the Saracen’s Head Inn, Glasgow, January 1776, recounting the tale ‘Sgeulachd air Mac Bàilidh Hiorta uair a chaidh e do Bhaile Ghlaschu (‘A tale of the Bailie of St Kilda’s son a time he went to Glasgow town’). Tha rannsachadh o chionn ghoirid leis an Dr Aonghas MacCoinnich air eachdraidh fad-fhalaichte nan Gàidheal agus Gàidhlig san Oilthigh bho chaidh a stèidheachadh ann an 1451, a thaisbeanadh. Tha an sgeul iongantach air a cur sìos san làrach-lìn dà-chànanach Sgeul na Gàidhlig aig Oilthigh Glaschu (‘The Gaelic Story at the University of Glasgow’). Gun teagamh sam bith, tha mòran eile ri fhaighinn a-mach tro thuilleadh rannsachaidh ann an tasglannan farsaing an Oilthighe. Tha iad sin a’ gabhail a-steach stuth a tha gu sònraichte co-cheangailte ri Gàidhlig, leithid clàran a’ Chomainn Oiseanaich air a ruith le oileanaich, a chaidh a stèidheachadh ann an 1831, agus clàran nas coitchinn far a bheil Gàidheil buailteach nochdadh ‘gun urra’ fo thionndadh Beurla de an ainm. A thuilleadh air a chlàran fhèin, tha Tasglann an Oilthighe na dhachaigh do Thasglann Gnothachais Alba, cruinneachadh cudromach gu h-eadar-nàiseanta de chlàran gnothachais bho air feadh Alba air fad, bhon 18mh linn gus an latha an-diugh. Nam measg mar a bhiodh dùil, tha clàran de ghnothachasan air an ruith le, a’ fastadh no frithealadh Ghàidheil, ged nach eil luchd-labhairt na Gàidhlig an-còmhnaidh furasta an comharrachadh. ’S e eisimpleir de chlàran co-cheangailte gu dìreach le Gàidheil, leabhar gheàrr-chunntasan Club Nigheanan Àirneis-cogaidh Gàidhealach a chaidh a chur air bhonn aig àm a’ Chiad Chogaidh Mhòir airson math na h-àireamh mhòr de nigheanan à Leòdhas a chaidh a thoirt sìos a dh’obair ann am factaraidhean àirneis-cogaidh a’ bhaile. Sorley MacLean / Somhairle MacGill-Eain. Songs to Eimhir and other songs / Dàin do Eimhir agus Dàin eile. Glasgow: MacLellan, 1943. Reproduced here with kind permission from The National Library of Scotland. Tha àireamh de nithean co-cheangailte ri Gàidhlig agus Gàidheil ann an Glaschu agus àiteachan eile ann an Alba, air an gleidheadh ann an Taigh-tasgaidh Hunterian an Oilthighe agus an gailearaidh ealain. Tha iad sin a’ gabhail a-steach, mar eisimpleir, cruinneachadh de chomharran comanachaidh air an cleachdadh ann an diofar eaglaisean sa bhaile. Is e an targaid Ghàidhealach as aosta a ghabhas a dhearbhadh aon de na h-ionmhasan, an sgiath chruinn thraidiseanta a bhiodhte a’ cleachdadh aig an aon àm ri daga agus claidheamh aon-làmhach. Dèante a-mach à fiodh, leathar agus meatailt, tha i air a h-ion-sgrìobhadh leis a’ cheann-latha 1623 agus na litrichean ‘DMK’ airson Dòmhnall MacAoidh, 1ad Mhorair Ràth, neach-poilitigs agus saighdear a thog rèisimeid de 3,000 fireannach Gàidhealach a shabaid don Danmhairg ann an Cogadh nan Trithead Bliadhna, agus às dèidh sin, rèisimeid eile airson sabaid do Rìgh na Suaine. Chunnaic MacAoidh fhèin seirbheis cogaidh air a’ Mhòr-thìr agus tha an sgiath aige a’ giùlain lorgan den sin. Dhaingnich anailis saidheansail o chionn ghoirid gu bheil na tha de ghearraidhean air uachdar na sgèithe, cunbhalach do bhuillean bho chlaidheamh no daga sa bhlàr. Bha iar-ogha Sir Dòmhnall, an 4mh Morair Ràth, air an robh Dòmhnall mar ainm cuideachd, ag ionnsachadh san oilthigh ann an 1722, ach chaidh an sgiath a ghibhteadh don Oilthigh le neach gun urra ann an 1913. 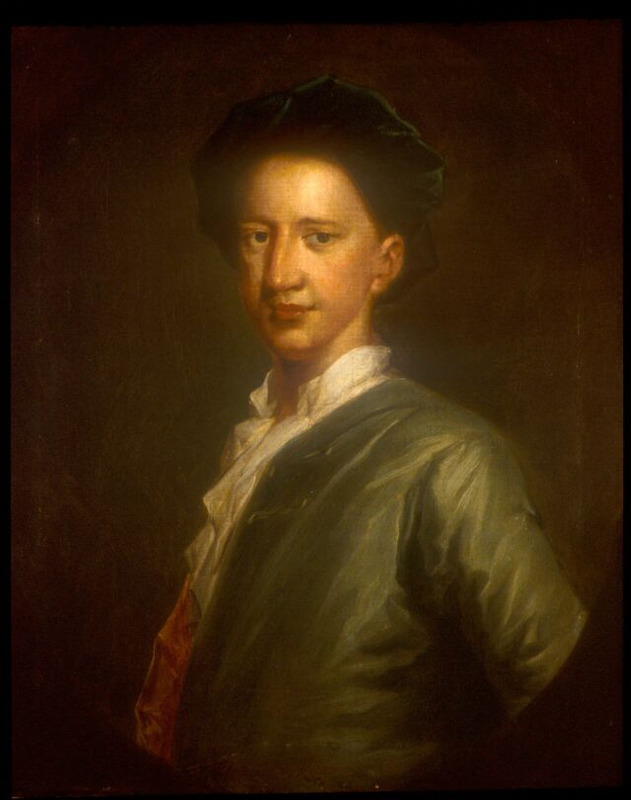 Rugadh agus thogadh Alasdair MacPhàrlain (1702-1755) le Gàidhlig anns an Àrar, agus coltach ri a bhràthair bu shine, an ceann-cinnidh Bhaltar macPhàrlain, fhritheil e Oilthigh Ghlaschu. Chaidh Alasdair air adhart a dhèanamh fortan mar mharsantach, neach-malairt thràillean, agus neach-seilbh planntachais ann an Iameuga, gu h-àraid a’ leantainn air fhastadh mar mhaighstir-postachad coitcheann ann an Kingston a thug dha smachd air a’ mhòr-chuid de thrafaig ann an litrichean ann an Aimeireaga a Tuath. Bha ùidh mhòr aige ann an reul-eòlas agus chuir e air bhonn amharclann ann an Kingston, làn den uidheamachd a b’ ùire. Ann an sin rinn e amharc reul-eòlais cudromach a chuir ri tomhas saidheansail air domhan-fhad. Aig àm a bhàis, dh’fhàg e a chruinneachadh reul-eòlasach agus sùim cudromach de dh’airgead mar dhìleab aig an Oilthigh airson amharclann a chur air bhonn, a’ chiad amharclànn air a thogail a dh’aon ghnothaich ann an oilthigh ann am Breatainn. Chaidh na h-ionnsramaidean a chur air ais air bàta tarsainn a’ Chuain Shiair ach cha do rinn an turas feum sam bith dhaibh. Dh’èigh an t-Oilthigh air Seumas Watt, teicneòlaiche agus innleadair an dùmhlaichear smùid, airson an càradh agus an dèidh an tilleadh gu feum a-rithist, chaidh an cleachdadh airson iomadh bliadhna ann anm teagasg reul-eòlas. Lean an amharclann gu 1870 nuair a ghluais an t-Oilthigh gu Gilmorehill. Recent research by Dr Aonghas Mac Coinnich has revealed the long-overlooked history of Gaels and Gaelic at the University since its foundation in 1451. The remarkable story is set out in the dual-language website Sgeul na Gàidhlig aig Oilthigh Glaschu (‘The Gaelic Story at the University of Glasgow’). Undoubtedly there is much more to discover through further research in the University’s extensive archives. These include material explicitly connected to Gaelic, such as the records of the student-run Ossianic Society, founded 1831, and also more general records in which Gaels tend to appear ‘incognito’ under an anglicized form of their name. In addition to its own records, the University Archive is also home to the Scottish Business Archive, an internationally important collection of business records for the whole of Scotland, from the 18th century to the present. These naturally include the records of businesses run by, employing, or serving Gaels, though Gaelic-speakers are not always easy to identify as such. An example of records directly relating to Gaels is the minute book of the Highland Munitions Girls Club which was set up during the First World War for the welfare of the large number of girls from Lewis who were brought down to work in the city’s munitions factories. The University’s Hunterian Museum and art gallery holds numerous items relating to Gaelic and Gaels both in Glasgow and elsewhere in Scotland. 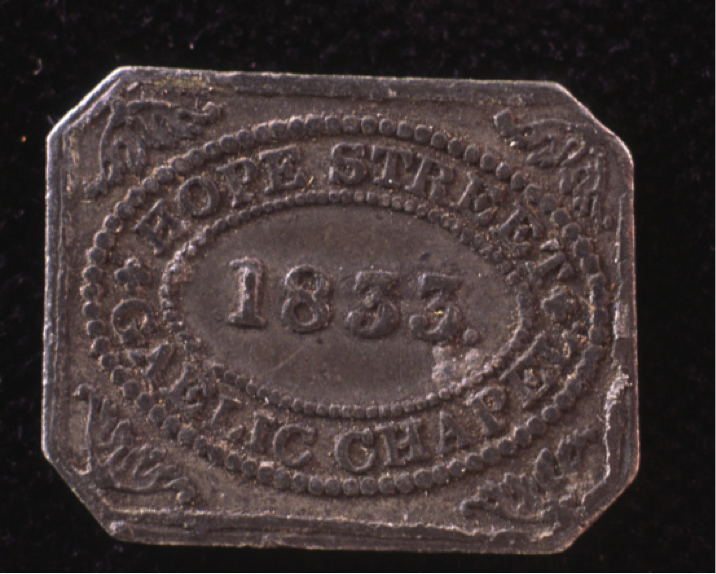 These include, for instance, a collection of communion tokens used in the city’s various Gaelic churches. One treasure is the oldest dateable Highland targaid or targe, the traditional round shield used in conjunction with a pistol and a one-handed sword. Made of wood, leather and metal, it is inscribed with the date 1623 and the initials ‘DMK’ for Donald MacKay. Dòmhnall MacAoidh, 1st Lord Reay, was a politician and soldier and raised a regiment of 3,000 Highland men to fight for Denmark in the Thirty Years War, and later, another regiment to fight for the King of Sweden. MacKay himself saw active service on the Continent and his targe bears traces of this. Recent scientific analysis confirmed that the numerous cuts on its surface are consistent with repeated striking by a sword or dagger in battle. Sir Donald’s great grandson, 4th Lord Reay, also called Donald, studied at the university in 1722, but the targe was gifted to the University by an anonymous donor in 1913. Alasdair MacFarlan (1702-1755) was born and raised in Gaelic-speaking Arrochar, and like his older brother, clan chief Walter MacFarlan, he attended Glasgow University. Alasdair went on to make a fortune as a merchant, slave trader, and plantation owner in Jamaica, especially following his appointment as postmaster-general in Kingston which gave him control of most of the North American traffic in mails. He had a keen interest in astronomy and founded an observatory in Kingston, stocked with the latest equipment. In it he made an important astronomical observation which contributed to the scientific measurement of longitude. On his death he bequeathed his astronomical collection and a considerable sum of money to the University for the founding of an observatory, the first purpose-built university observatory in Britain. The instruments were shipped back across the Atlantic but the sea voyage did them no good. The University called on the famous inventor James Watt, then just a young man, to repair them and, having returned them to working order, used them for many years in the teaching of astronomy. The observatory survived till 1870 when the University moved to Gilmorehill. Portrait of Alasdair MacFarlan (1702-1755) by John Vanderbank, reproduced here by kind permission of the Hunterian Museum, the University of Glasgow (© The Hunterian, University of Glasgow 2014).